Each time Palestinian farmers try to pass through the separation wall's gates towards their olive fields they face tough Israeli measures such as: checking IDs, searching belongings and insulting and humiliating them. Mahmoud Eshteya, one of the farmers whose land was separated from Salfit town by the wall, told the PIC: "We passionately yearn for the olive harvest season each year, but this happiness has been turned into a daily suffering throughout the season". He said, describing one of those harvesting days: "At about 4:30 am. I prepared everything I need for olive harvesting, and headed to the gate the Israeli soldiers specified for us to cross the wall that separates our lands from where we live, and after a long time of wait an Israeli army jeep showed up and a soldier opened the gate and asked us to show our IDs, confiscated them and scrutinized all our belongings". The occupation also specified the entry and return hours, Eshteya pointed out, adding: "The soldier was inspecting us while insulting and yelling at us, then he confiscated our IDs and only returned them back when we finished and returned, and then he told us that we have to return before 4:00 pm, otherwise they will not allow us to pass through the gate." For his part, Ahmad Mawqedy, a farmer from west Salfit, said:" We used to enter our fields whenever we wanted, we could even sleep there but now we need a permit and a humiliating inspection". 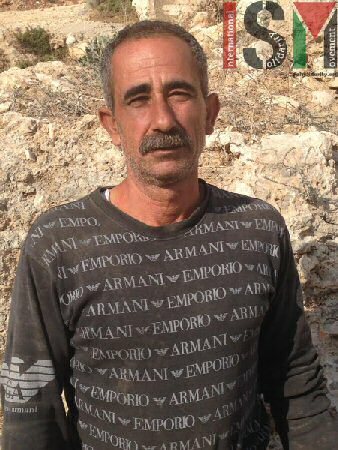 Ali Naser, another farmer from Salfit, also complained about being humiliated by the soldiers while passing through the wall, and mentioned some Israeli provocative practices, such as humiliating inspections, blowing their sirens, confiscating the farmers' IDs and yelling at them. Another farmer, Khalil Hasan, said:" The soldiers are stealing our happiness, they prevent us from leaving through the wall even if a farmer has an accident like a snake bite or falling from a tree". Khalid Ma'ali, a researcher, said: "Extremist Israeli settlers escalate their attacks against Palestinian olive groves as the olive harvest season begins. 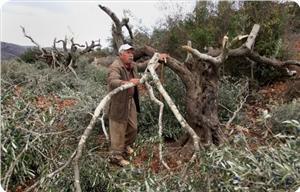 Yesterday they cut scores of olive trees in eastern Salfit". Talking about the negative effects of the wall on the Palestinians' lands, Ma'ali said: "Farmers' risks are really high, and the rates are growing. For example, the segregation wall confiscated 95% of the land of Mas-ha village (about 5500 acres)." He added that two-thirds of Salfit land were either confiscated by the Israeli occupation authorities or forcibly left without farming, while thousands of acres behind the separation wall are susceptible to bulldozing and settlement expansion. A number of extremist Israeli settlers invaded Palestinian orchards near the West Bank city of Bethlehem, before cutting and uprooting dozens of olive trees. Hasan Breijiyya, coordinator of the Popular Committee against the Wall and Settlements in the Bethlehem district, stated the settlers came from Beitar Illit illegal settlement, built on Palestinian lands belonging to residents of Nahhalin, Husan and Wadi Fokkin, and uprooted around 38 olive trees, and harvested them. 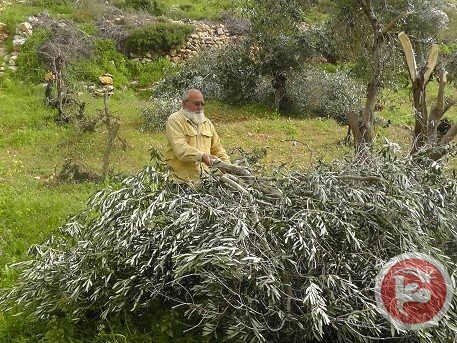 The settlers also cut around 200 olive trees belonging to Mahmoud ‘Atiyya Shousha, in Ebtat nearby area, next to the settlement. 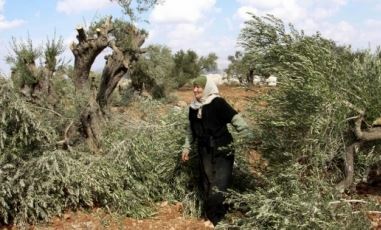 Breijiyya said Israeli soldiers and settlers have escalated their attacks against Palestinian orchards, west of Bethlehem, by illegally occupying orchards, uprooting trees and burning them, especially in orchards that became surrounded by the Beit Illit settlement, and close to it. 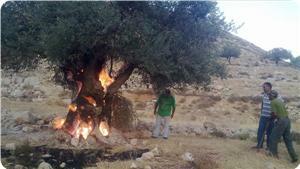 On Tuesday, October 7, a number of settlers torched 30 olive trees dating from Roman times, in the village of Nahhalin. 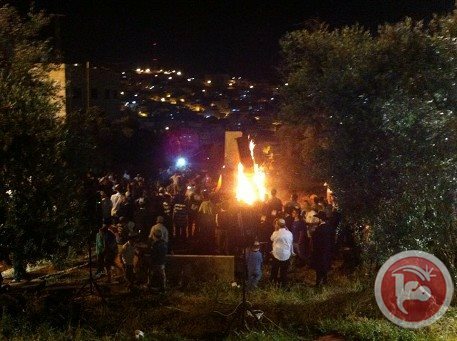 Dozens of Israeli settlers clashed with Palestinian farmers, on Thursday evening, in the Yanun valley, near the village of Aqraba, to the south of Nablus. PA official, Ghassan Daghlas, who monitors settlement activity in the northern West Bank, told Ma'an News Agency that several Israeli settlers from Itamar attacked dozens of Palestinian farmers and attempted to steal their olive crop, which belongs to the Abu Rinan family. Clashes subsequently broke out, though no injuries were reported. Villages south of Nablus are frequently targeted with settler violence and ensuing clashes between Palestinians and Israeli forces, as these villages are located beside the notoriously violent (and illegal) Israeli settlements of Yitzhar, Bracha, and Itamar. 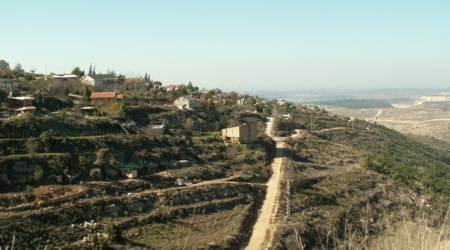 Settlers frequently attack a number of local villages, destroying crops and preventing farmers from reaching their lands, according to United Nations statistics. Settler violence against Palestinians and their property in the occupied West Bank is systematic and backed by the negligence of Israeli authorities, who rarely intervene in the violent attacks or prosecute the perpetrators. Ma'an further reports that, in the year 2013 alone, there were 399 incidents of settler violence against Palestinians in the occupied West Bank, according to the UN Office for the Coordination of Humanitarian Affairs. Tuesday afternoon, the 7th of October, olive farmer Mahmoud Rga Mahoud Aid, his wife and their three children were attacked by a group of settlers from the illegal settlement of Giv’at Ya’akov. 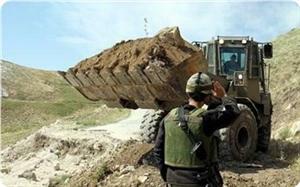 The attack took place on the family´s land near the village of Burin, south west of Nablus. Mahmoud walked down the hill, wounded, and was stopped by another group of soldiers who detained him for allegedly attacking the settlers and “causing trouble”. The commander called one of the soldiers that witnessed the attack and even though this soldier told the truth, stating that Mahmoud was attacked, the commander asked for Mahmoud’s passport number and personal information to make a file on him. 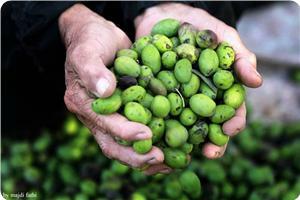 Furthermore, Mahmoud lost his permission for the third and last day of olive picking. 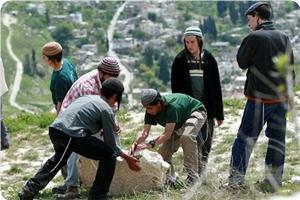 Israeli settlers attacked, on Monday, a Palestinian-owned olive grove near the northern West Bank district of Nablus. 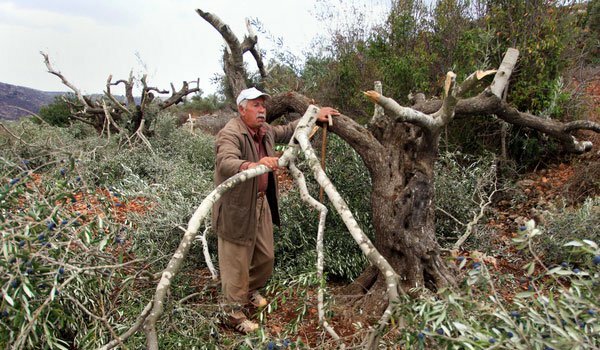 The settlers cut off the branches of 100 olive trees owned by Palestinian farmers from the Bani Yasouf village, near Nablus. The settlers came from the illegal settlement of Tafouh. Another group of settlers also damaged 20 olive trees owned by Palestinian farmers from the village of Awarta, also near Nablus. Local sources are reporting an increase of attacks on Palestinian farmers by Israeli settlers since the olive harvest season began three days ago. The Israeli military leveled lands in Kfar a-Dik, a Palestinian village in the Salfit district of the central West Bank, locals reported. 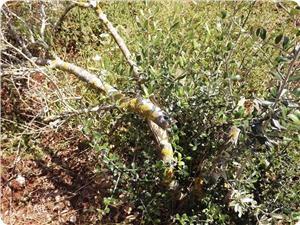 On Monday settlers chopped down olive trees north of Beit Ummar, in the Hebron district. According to Khalid Maali, a local researcher in the central West Bank , an Israeli court had approved confiscation of 3,000 dunams of land. The bulldozers, however, leveled an area of more than 10,000 dunams (2,500 acres). 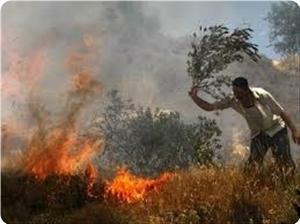 Israeli settlers chopped down 15 olive trees in the Abu Ar-Rish valley to the north of Beit Ummar on Monday . 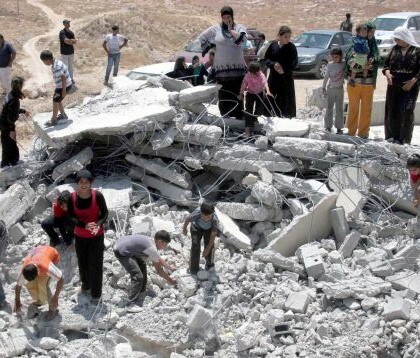 Mohammad ‘Ayyad, a spokesperson for the local popular committee against settlements, said the damage was carried out by settlers from the nearby Bat Ayn. 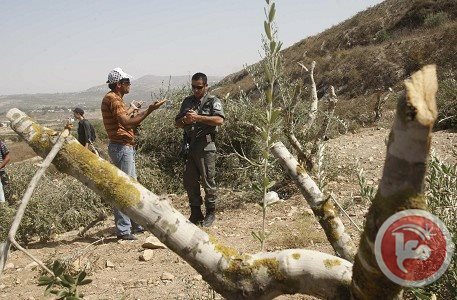 Although an Israeli court ruled that the Palestinian owner of this land install a barbed wire fence around his approximately 80 dunam area to protect it against settler attacks, Israeli forces have obstructed the implementation of this ruling, allowing settlers to continue their attacks unabated. 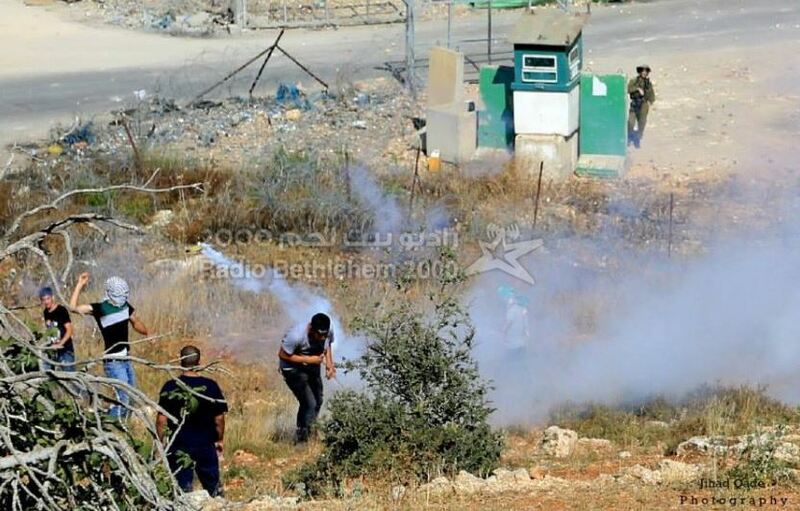 Palestinian medical sources have reported that several Palestinians suffered the effects of tear gas inhalation, and one child was injured, during clashes with Israeli soldiers in front of the Ofer Israeli Prison, west of the central West Bank city of Ramallah, and near the Qalandia terminal. Eyewitnesses told the WAFA Palestinian news agency that the soldiers violently assaulted nonviolent protesters in front of the Ofer prison, leading to clashes between the soldiers and the protesters. The army fired rubber-coated metal bullets and dozens of gas bombs, causing scores of Palestinians to suffer the effects of tear gas inhalation. Medical sources said the soldiers also kidnapped Maher Haroun, 17 years of age, and took him to an unknown destination. The Radio Bethlehem 2000 has reported that clashes also took place near the Qalandia terminal, south of Ramallah, and that the soldiers fired several gas bombs, concussion grenades, and rubber-coated metal bullets. Dozens of residents received treatment for the effects of tear gas inhalation. In related news, soldiers attacked Palestinian protesters in Teqoua’ town, east of the West Bank city of Bethlehem, and fired gas bombs and concussion grenades at them. Local sources said many bombs set off by the soldiers caused fire in dozens of dunams of farmlands planted with wheat barley and olive trees. Israeli bulldozers leveled large tracts of Palestinian land in the Bethlehem-area village of Nahalin on Monday, locals said. 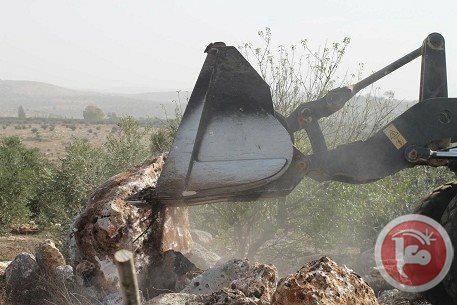 Head of the village council, Majid Ghayatha, told Ma'an that Israeli bulldozers uprooted dozens of olive and almond trees in the Wad Salem area. Several grapevines were also destroyed. Israeli military forces deployed on hilltops above the village to prevent land owners from accessing their fields. Locals told Ma'an that they believe Israeli forces are clearing land for a new road connecting the Neve Daniel and Beitar Ilit settlements. A spokesman for Israel's Coordinator of Government Activities in the Territories did not answer calls seeking comment. Several Israeli military jeeps, accompanied by a military bulldozer, invaded Tel Romedia area, in the center of the southern West Bank city of Hebron, where they demolished a wall surrounding a Palestinian home, and uprooted a nearby Palestinian land. Resident Feryal Abu Haykal told the Palestinian News & Info Agency (WAFA) that personnel of the so-called “Israeli Department of Antiquities” accompanied by several Israeli jeeps surrounded her father’s home, and demolished its wall. She added that the army also uprooted farmland belonging to her father, and informed the family that the digging is part of “archaeological excavations”. Abu Haykal told WAFA that the soldiers also wanted to uproot and confiscate a thousand-year-old olive tree, in her father’s yard, but the family managed to save it. Nafaa’s land is located at the southern corner of Khilet Al-Eis, one of the largest forest areas in the West Bank. Um al-Rayhan village is a home to 500 citizens, all Zaid Kilani’s offspring, surrounded by Israeli settlement from all sides. Fanatic Israeli settlers have uprooted yesterday dozens of olive trees and grapes in a Palestinian agricultural land in Bethlehem, southern West Bank. 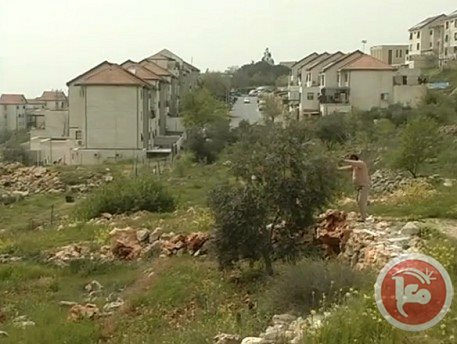 Local sources confirmed that a group of settlers uprooted late yesterday 58 olive, grape and almond fruit trees after breaking into Palestinian land in the city. 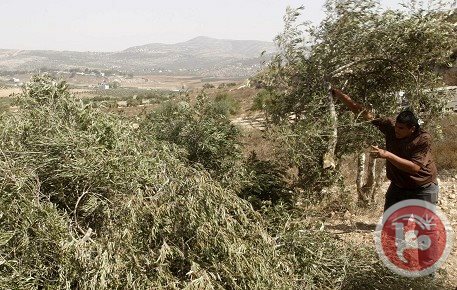 The sources added that settlers from Beitar Illit settlement stormed an agricultural land, located in an area of 51 dunums, belonging to a Palestinian farmer, and uprooted his trees. 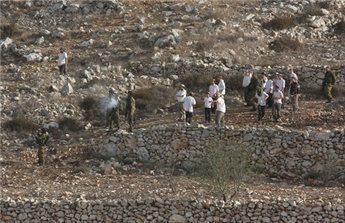 The mentioned agricultural land is exposed to daily attacks by settlers as part of their attempts to appropriate the land.